The Original Smart Swatter is the best fly swatter and mosquito killer ever. The proud owner of a USA-patented design, it's the only bug swatter that features 904 spikes that are able to hold onto dead bugs after you whack them. No more sweeping up floors or cleaning off splattered bugs from ceilings or walls after each bug battle. Win the war on bugs with our amazing Smart Swatter. You don't need to pay for a pricey electric fly swatter that doesn't really work like you had hoped. Just keep our Smart Swatters nearby and eliminate the pesky little pests yourself. Our fly swatters have hundreds of spikes (904 to be exact!) that hang onto the insects until you drop them in the garbage. Just swat, stab, and flick them into the trash, so your hands stay clean from guts and germs. No mess, no guess! No more bug-balancing games or looking for dead bugs on your rugs. Our heavy-duty swatter measures 17.9 x 4 x 0.1 inches with a longer handle and wider face to assist you in making a perfect shot every time. Our fly swatters for kids and adults to use is easy to hang up, with an extra long cut-out for nails, screws, hooks, or pegs. 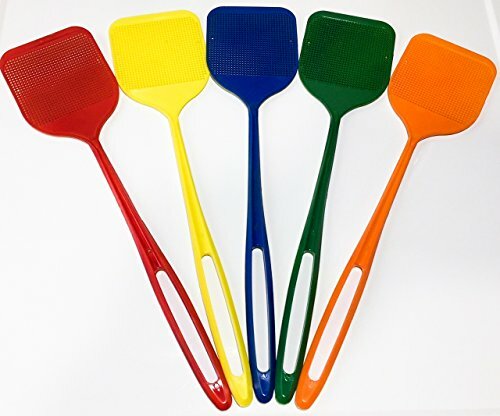 We offer our bug swatters in five bright colors so you can find them easily whenever and wherever you need them. Choose from red, orange, yellow, blue, and green. We send a package of two with each order, so you can be prepared on more than just one front. Don't even try to go camping, fishing, or traveling without one of our mosquito killer and bug eliminators. Keep them indoors and outside for the garage, patio, and near the outdoor furniture. Keep filthy bugs and insects away from your party, and your food. We purchased just about every other fly swatter on Amazon to test it against our product. We believe our flyswatter is far superior than any other bug swatter available. We're so confident you'll love the Smart Swatter that we will give you your money back if you are not completely satisfied. Smack Smarter, not harder! PICKS UP BUG - What makes the Smart Swatter the best? It has 904 spikes to whack and smack bugs, the bug then gets stuck in the spikes. To remove the bug simply bang the side of the trash can and the bug will fall right in. No more playing that silly bug balance game or hide and seek. Just swat, stab, and flick them right into the trash, so your hands stay clean from guts and germs. No mess, no guess! PATENTED FLY & MOSQUITO KILLER - The Original Smart Swatter is a patented fly swatter for killing mosquitoes, flies, spiders, and other bugs that annoy and invade indoors as well as outdoors. Destroy them all with confidence by using the Smart Swatter. The genius design delivers 17.9 x 4 x 0.1 inches of bug-fearing, spider-killing, fly-whapping power to get rid of icky bugs once and for all. HEAVY-DUTY DESIGN - Our heavy duty bug swatter is the best fly, mosquito, and bug killer around. No need to buy and install electric bug zappers, or an electric fly swatter that disappoints and leaves you picking up and cleaning up afterward. Our heavy duty bug killer is made of tough, high-quality plastic designed to take lots of bug swats and whacks while you eliminate all of those pesky pests. 2-PACK ASSORTED COLORS - If you wish to select your color please search for our listing by searching Smart Swatter or click the blue Smart Swatter above the title. With each order, we send a pack of two heavy-duty bug disposers for your convenience. Keep them indoors as well as outdoors, in the car, tent, or camp trailer. You can even take them on fishing trips. There are five bright colors available, including red, orange, yellow, blue, and green. Easy to find. MADE IN USA - If you have wanted a mosquito swatter as seen on t.v., this is exactly what you need to win the bug war. Our patented design has a heavy-duty plastic construction to attack flies, spiders, flying insects, and other creepy crawlies. It's the best fly swatter, mosquito killer and bug eliminator ever, made with 904 merciless spikes right here in the USA for long-lasting durability. If you have any questions about this product by Smart Swatter, contact us by completing and submitting the form below. If you are looking for a specif part number, please include it with your message. Ryobi P2660 18V Lithium+ Hedge Trimmer- 22"